Research has suggested that British tourists are spending an extra £260 million a year in fees for using overseas cash machines. 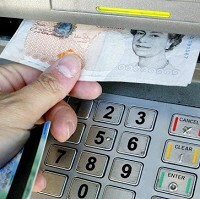 Travel agent www.sunshine.co.uk said that around two-thirds of holidaymakers from the UK use ATM machines while on foreign holidays. The poll of more than 2,000 holidaymakers found that people use ATM machines five times during their holiday, on average. It also tabled an average cost of nearly £3 for each time they draw out money. The travel agent multiplied these figures by the number of holidays made by Brits abroad last year, making a total average ATM bill of £260 million. More than half of people were shocked by the fees they had racked up using cash machines abroad when they saw their statement, according to the findings. The findings could prompt people to be better prepared when it comes to arranging spends for their next holiday - as a bonus the cash they save could be used to purchase travel insurance to cover any unforeseen circumstances. Sunshine.co.uk co-founder Chris Clarkson said: "There's nothing worse than getting home from a nice relaxing holiday, which cost a fair amount to go on in the first place, only to be hit by extra charges like credit card withdrawal fees."